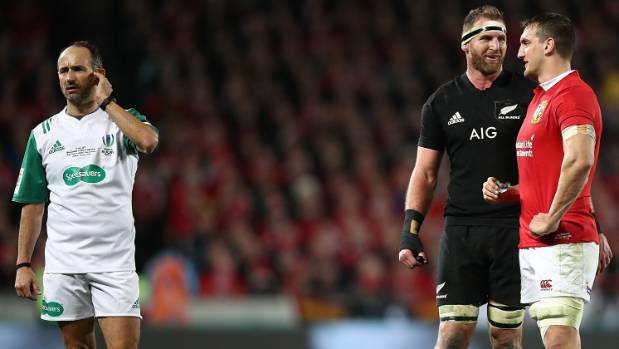 The All Blacks will not have controversial figure RomainPoite officiate them at the Rugby Championship after their recent encounters. They would have another French referee Jerome Garces regulate proceedings when they play their two toughest games at the Championship. The appointments for each fixture were announced on Tuesday. Garcesofficiated the game against the British and Irish Lions – which ended in a second Test loss. The same man would be in the middle when the All Blacks face away games against the Aussies and the Boks. The games are poised to happen on August 19th and October 7th. When the All Blacks met the Lions at Westpac stadium in July, it was Garces that sent off Sonny Bill Williams while awarding a match winning penalty late in the game to the Lions to see them win 24-21.